Walking through Woods Memorial Natural Area one day recently, I came upon a beautiful arrangement of flowers and other natural objects set upon the round cover of an old water main that protrudes about two feet out of the ground. Seeing that unexpected burst of color and creativity in the middle of the woods gave me a moment of joy. I admired it, took a picture and walked on. A week or so later, I was on that same section of the Woods Creek Trail when I noticed the arrangement had been changed, with the old items removed and new ones in their place. "Aha!" I thought, "We have a fairy in our woods!" And then, during another walk in the natural area, I caught the fairy in the act. A slight woman with blond curls and bright, blue-green eyes, she really did look like a fairy to me. I thanked her for her contribution to the beauty of the woods, and the next time I saw her she agreed to be interviewed for my column. Thus I learned her name is Donna Zerner, and that she calls her creations "nature mandalas." My first assumption was that she was an artist, but she assured me that no, she has no talent in the visual arts. I beg to disagree. Nevertheless, Zerner is a writer and editor, a storyteller and even, upon occasion, a stand-up comedian. 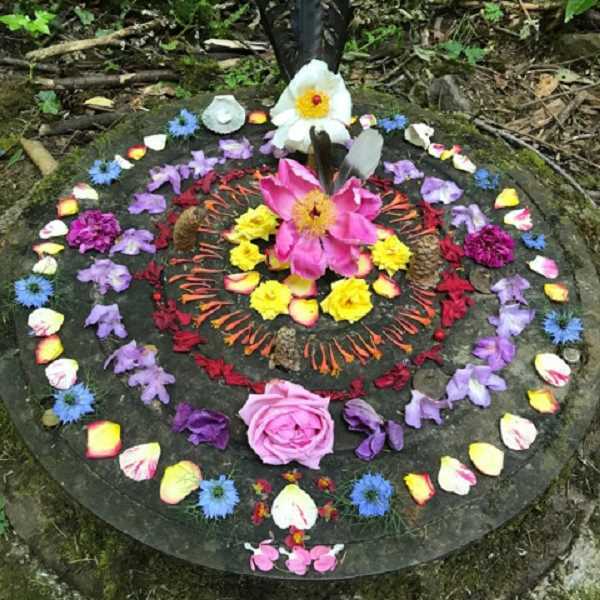 I asked her what inspired her to make the mandalas and to return once a week or so, weather and motivation permitting, to refresh or remake them entirely. Her answer was simple: She does it for her own pleasure, and for that of others. "If I can make one person smile," she said, "it's worth it." I would hazard a guess that she has made more than one person smile. Though a lot of people just walk by while she's at work on a mandala, she says, others stop and thank her. She related that several people have told her, "No matter how depressed I am, seeing this always cheers me up." Zerner started creating these mandalas a couple of years ago as a way to get off her computer and do something more grounded and tactile. She says arranging the colorful objects, sheltered by the trees while listening to the babbling creek and the singing birds, feels like an entrancing meditation. And seeing her careful work inevitably demolished by the elements and visiting creatures offers lessons in impermanence and non-attachment. "It's like those Tibetan sand paintings," she says, "but with slugs." The mandalas change with the seasons. She displays colorful flowers, feathers and robin's egg shells in the spring and summer, and mushrooms, holly berries, apples and red and yellow leaves in the cooler months. Zerner mainly uses objects she finds on the ground on her walk to the woods, though she will sometimes pick flowers from her own yard. When children stop by, she invites them to "help the fairies decorate their ballroom for dancing," and offers them petals and stones to place where they want. She loves when passersby leave items — coins and crystals are regular contributions — and says, "I want everyone to feel free to add to and work on this; it should be a community activity." I can't deny that Zerner blushed a bit when I told her I think of her as the fairy of Woods Memorial, and that I bet others do, too. In a way, I almost hesitated to reveal her identity, since I think some folks enjoy the mystery of the "fairy" who makes these beautiful offerings. And yet, once I spoke to her and realized that she aims, as she says, to add beauty to a world that can feel bleak, and to inspire others to discover the joy of creativity in nature, how could I not consider her efforts supremely sincere and want to share them with you? Sadly, just as the mandalas are impermanent, so may be her commitment to creating them. She will, she says, as long as she is inspired and life allows. She did suggest that maybe those of us in Southwest Portland who enjoy the peaceful quiet of Woods Memorial Natural Area, its trails and creeks, its beauty, and the dense forest green, not spread the word around too far (like I'm doing right now). Access to the park can be reached from a variety of entrances on Southwest 45th Avenue and on other streets between 45th and Southwest Capitol Highway. If you're not familiar with the area, I suggest you go to portlandoregon.gov/parks/finder, where you can download a map after searching Woods Memorial Natural Area. And remember, like the fairy said, shhhh, it's a secret! Extraordinarily sincere — Great customer service; high-quality products at appropriate prices; local, sustainable or eco-friendliness given high priority. Makes me want to bring my mom. Very sincere — Notable customer service; better-than-average-quality products; some thought given to sustainability, etc. They actually seem to care. Pretty sincere — Working hard to make me believe they're extraordinarily sincere, but there are some cracks in the facade. Not sincere at all — Customer walking in the door viewed simply as a dollar sign. Not even in the ballpark — Poor customer service; price gouging; salespeople only available if they think I'm going to steal something.